No, the kilogram won’t be a pound, but it will be rather different. In 18th century France, there were 250,000 different units of measurement, some with different names and some, the same. Assorted fabrics, grain, and wood all had their own metric. If you sold a pint in several places, the amount could have varied by 20%. It all changed during the 1790s when two scientists attempted to create some standardized measurement. First they had to define a metric and then to universalize it. As for the measurement, they focused on the meter by calculating the distance from the North Pole to the Equator and dividing it by 10 million. The task was actually a huge trigonometry problem as each one traveled from one place to the next creating imaginary triangles to measure the distance. Then, from the size of the meter, they could leap to the kilogram and define it as “a cubic decimeter of rainwater at 4 degrees Celsius.” Almost a century later, scientists created a prototype platinum kilogram cylinder protected by three bell jars. Still today it sits in a vault in Sèvres, France that opens with three different keys held by three different people. Seventeen nations also set up a standardization framework in 1875 through the Treaty of the Meter. But was the problem solved? Sequestered in a safe and secure place, the kilogram standard can be visited, but not easily. And yes, it does have “reproductions” around the world but it’s tough to be sure they are all the same weight. Recently, the French benchmark lost 45 micrograms and no one knows why. That meant though that all of its reproductions around the world were off by 45 micrograms. Even such a tiny difference is massive for scientific instruments, pharmaceuticals, airplane parts. So, reflecting the quest for greater precision and accessibility, the kilogram will change from an object to an idea that requires Planck’s Constant and a device called the Kibble balance. At their November 13-16 meeting, the International Bureau of Weights and Measures reported the following. Much more than measurement, standardization is about commerce. Only when we know how much we are selling and buying can we minimize the hassles–aka the transaction costs–and focus on the market. 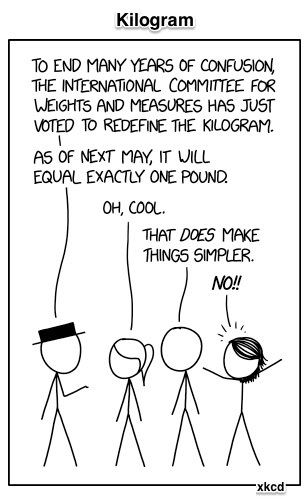 My sources and more: Today’s post began with the xkcd cartoon that reminded me it was time to return to the kilogram. From there, at the NY Times, Vox, and The Washington Post, I found lots was happening. But if you want just one link, do return to this 2014 Radiolab podcast on the kilogram. 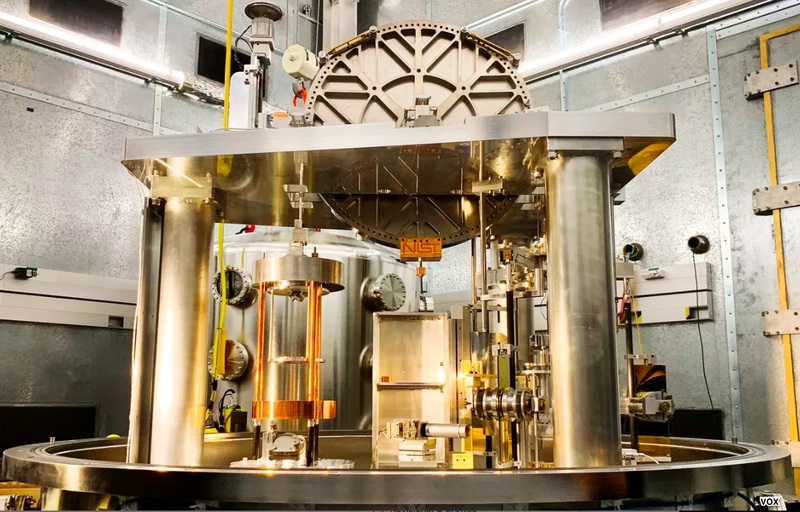 Our featured image of the two bell jars that house a U.S. kilogram comes from Radiolab and the Kibble balance photo was from Brian Resnick/Vox. Please note also that several sentences about the history of standardization came from a past econlife post.